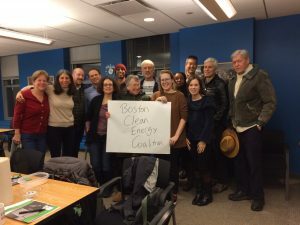 A grassroots advocacy association, the Boston Clean Energy Coalition (BCEC) works to create an organizing space that accelerates efforts in Boston to transition to a clean, green economy. BCEC currently focuses on halting the expansion of fracked gas and other fossil-fuel infrastructure while promoting net-zero-carbon standards for the built environment. We believe this goal can be achieved only by fostering collaboration among all sectors, including the City, private developers, community stakeholders, architects, financial investors, academia, labor, environmentalists, and faith-based organizations. We seek strong, democratic, political leadership and a process that develops sound public policy, recognizing that both require constant vigilance and a concerned eye on our future. Funding for the Boston Clean Energy Coalition was provided by the New England Grassroots Environment Fund. New England Grassroots Environment Fund awards help solve the problems and realize the promises in addressing climate change and energy action, local food, environmental health and justice, land and water and local economies. For more information, please visit grassrootsfund.org or call 603-905-9915.